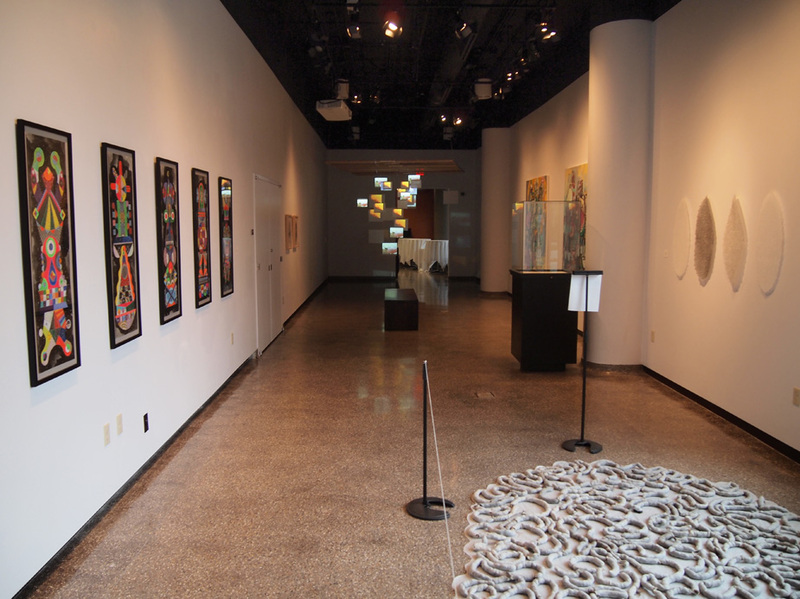 Group show with Trent Miller, Susan Johnson White, and Michael Velliquette, at the University of Wisconsin-Madison’s Gallery 1308 (October – November 2011). 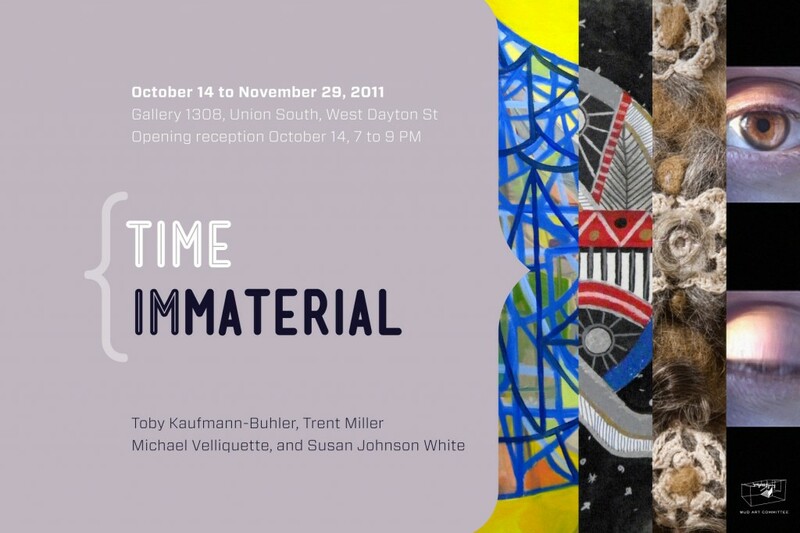 In this exhibition, unique explorations of time will be the thematic thread pulling all four artist’s work together. We use painting (Trent Miller), drawing (Michael Velliquette), video/sound (Toby Kaufmann-Buhler), and materials such as hair and linen (Susan Johnson White) in order to explore cycles of time in memory, history and space. In “Horizon Life (the appearance of distance)”, a video and sound installation by Toby Kaufmann-Buhler, the perception of distance and travel is collapsed from the actual experience into an exploration of space-time relationships. 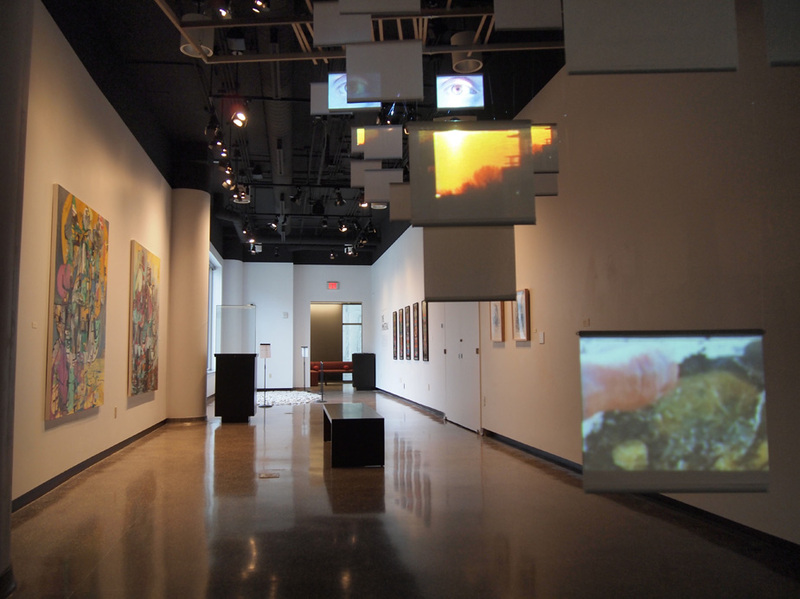 Several horizons, depicted in image and sound, represent the exploration of new environments and the compulsion to reach the edge of a place that is always moving and changing. Trent Miller’s newest paintings feel clunky, playful and even a bit nostalgic. Taking his cues from children’s drawings, travel photos, memories, the subconscious and movies, as well as the history of painting, Miller uses free association to explore the splintered narratives that can exist together in a space. This involves creating and destroying multiple layers until a final, unexpected image comes to the surface. Miller compares this process to “making something from scraps without any instruction manual.” The results appear loose and open, as if the images or narratives are still being formed. Tantric drawing, totems, sacred architecture and votive statuary all influence the current mixed media drawings by Michael Velliquette. Using a combination of acrylic paint, enamel markers, colored pencils and ink washes, Velliquette meticulously renders brightly colored and densely patterned forms that float against nebula-like backgrounds. These abstract figures hover fixed in a kind of visionary space and time, like stars in the night sky. Susan J. White continues to explore the relationship between the handmade and the body, creating work that derives meaning from both process and material. Based on one of her grandmother’s linens, this work focuses on the actions of making and marking from two different time periods (then and now), translating the textile process into drawings and paintings as well as a large floor piece made with gut and hair.